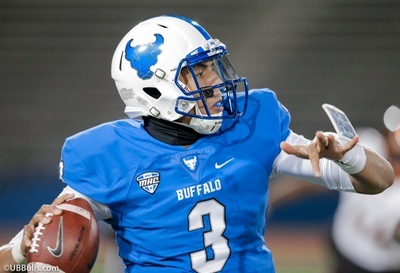 Each week, Buffalo Sports Page’s Bob Gaughan recaps the college football weekend with a focus on the hot teams, upsets and quarterbacks. Miami-Florida beat Notre Dame 41-8. The only time they beat the Irish worse was the famous Gerry Faust last game 58-7 in 1985. The Hurricanes used four turnovers to build a 27-0 lead. The Notre Dame running game went no-where all night. Josh Adams and Brandon Wimbush combined for 64 yards on 27 carries. Forced to pass Wimbush proved inaccurate and ineffective. The swagger was back on the sidelines. Ed Reed wearing their now famous turnover chain reminded me of the Micheal Irvin teams. The speed of the Hurricanes was evident particularly on defense. The “U” will face Clemson in the ACC title game. Both teams this week will be in the top 4 of the playoff. Like Notre Dame you always felt this year if Georgia had their running game stopped could they win a game. The answer was a big “NO” on Saturday in the plains as Auburn whipped Georgia 40-17. Nick Chubb and Sony Michel combined for 48 yards on 20 carries. Jake Fromm couldn’t pass the Bulldogs to victory. In his defense he was under pressure all night as Auburn won both lines of scrimmage. Georgia made way too many mistakes to beat a good Auburn team. Georgia special teams blunders set-up three Auburn touchdowns. Auburn still has the Iron Bowl coming up in two weeks. It will be interesting how far Georgia falls out of the top 4. Auburn’s ranking will be interesting as well. I could see Auburn being 6th and Georgia 7th in the rankings. Alabama barely survived in Mississippi State pulling out a 31-24 win. With the score tied 24-24, Jalen Hurts drove the Tide 69 yards in 44 seconds. Hurts hit Devonta Smith from 26 yards out with 25 seconds remaining to give Alabama the victory. Injuries at linebacker maybe taking it toll on the Alabama defense. The Bulldogs rushed for 172 yards on the ground. This coming off the LSU game where the Tide were out gained. If Alabama can’t sure up their running game then Auburn will defeat them in two weeks. Clemson used a dominant defense to beat Florida State 31-14. FSU was held to barely over 200 yards of offense. Clemson offense sputtered at times and is a concern considering how good Miami looked vs Notre Dame. For the first time all year it appears that the best team in the ACC might not be Clemson. Baker Mayfield was good but it was running back Rodney Anderson that led the Sooners to a 38-20 win over TCU. Anderson had 290 combined rushing and receiving and four touchdowns. Baker Mayfield was solid as usual throwing for 333 yards and 3 scores. Mayfield’s performance was another positive for his Heisman quest. The TCU defense ranked 6th in the country coming into the game. The victory will move Oklahoma into the top 4 in the playoff. Wisconsin remained undefeated with a 38-14 win over Iowa. The Badgers were able to overcome two defensive touchdowns by NFL prospect Josh Jackson. This is a week after he had three interceptions vs Ohio State. The Badgers held Iowa to five first downs and 66 total yards of offense. The committee hasn’t given the Badgers any love this year in spite of going undefeated. Next week Michigan comes to Camp Randall. I expect the Badgers to be 5th in the rankings this week. Who can figure out Ohio State? The Buckeyes look awful last week against an obvious mediocre Iowa offense. How does Ohio State look so bad losing in Iowa 55-24 and then turnaround and destroy Michigan State 48-3. The Buckeyes outgained the Spartans 524-195. The running game of Mike Weber and JK Dobbins combined for 286 yards and two touchdowns. Lamar Jackson became the first player to have back-to-back 3,000 yard passing and 1,000 yard rushing seasons. Jackson’s 4 TD’s led Louisville to a 38-21 win over Virginia. Josh Allen had two scores in Wyoming’s win over Air Force but he left the game and never returned. He was holding his arm when he left the field in Wyoming’s 28-14 win over Air Force. Josh Rosen returned to action throwing for 381 yards and a touchdown. Rosen wasn’t sacked once he should good elusiveness from the Arizona State rush. UCLA won 44-37. Next week it’s Darnold vs Rosen as USC takes on UCLA. Sam Darnold improved to 18-3 as a starter throwing for 329 yards and two touchdowns in the Trojans 38-24 win over Colorado. The win clinches the Pac-12 South for USC. Mason Rudolph threw for 376 yards and three touchdowns as Oklahoma State won a shootout 49-42 over Iowa State.